For the word, Precious, I had to do my newest nephew, Isaac. However, I am not confident with portraits, so I worked him up in graphite pencil first. Then inked it. I plan to keep working on more portraiture, because it is such a challenge with great reward when you get it right. Flowing is in process. Cruel was next. I did a fast sketch just for fun and have no intention of reworking it. I did not like this prompt until I thought of how cruel it is when birding to discover a wonderful one was behind you the whole time. In this case, a Sandhill Crane. 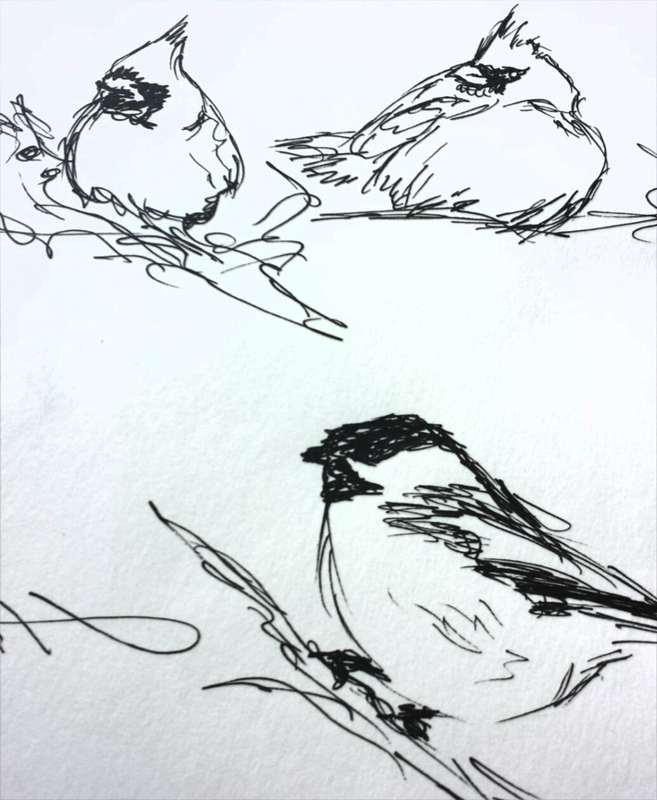 I shared a throwback to last year to show I really can draw these birds. Cartoon style is still a struggle for me. I skipped Whale and went straight to Guarded. This was a very technical drawing, so I sketched it first, then inked it. We ended on clock, which did not inspire me, so I skipped it. I am batting a low average this Inktober. 5 last week and 4 this week. We will see if we can’t beef that up next week. The above image was my favorite for this week. I was trying new things – this was my niece having a hard time of it when she found her daddy’s jeans hanging on the line. It is one of my favorite moments. Faces and emotions are not easy to capture. I vow to work this next year to do better with them. 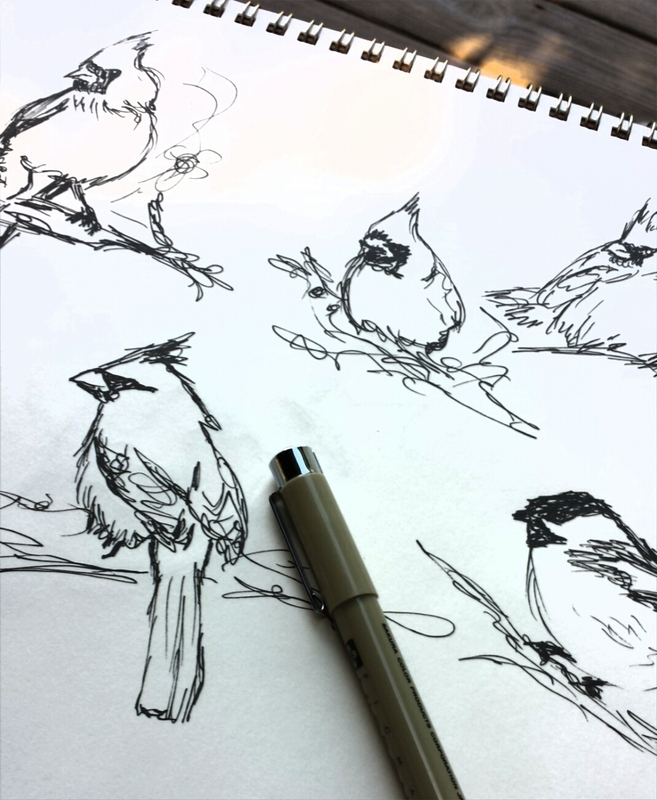 This has been the year for sketching the birds I am photographing and spending time watching all the youngsters figure out their big new world. I started last fall doing the above types of 5 second sketches. I like to use ink for the initial sketches because it forces me to capture their essence without overworking and overthinking it. Perfection is not the aim and ink is always full of lines that can not be erased, so that forces my letting go of the OCD side of my personality. This month I started spending a little more energy on the initial sketch then adding various views of the same bird in pencil. We have had so many Downy Woodpecker babies this year that I decided to catalog them to see who sticks around. Did you know that you can tell them apart by their head stripes? It has been fun and very illuminating to learn about these individuals visiting my feeder. An exercise in “seeing”. 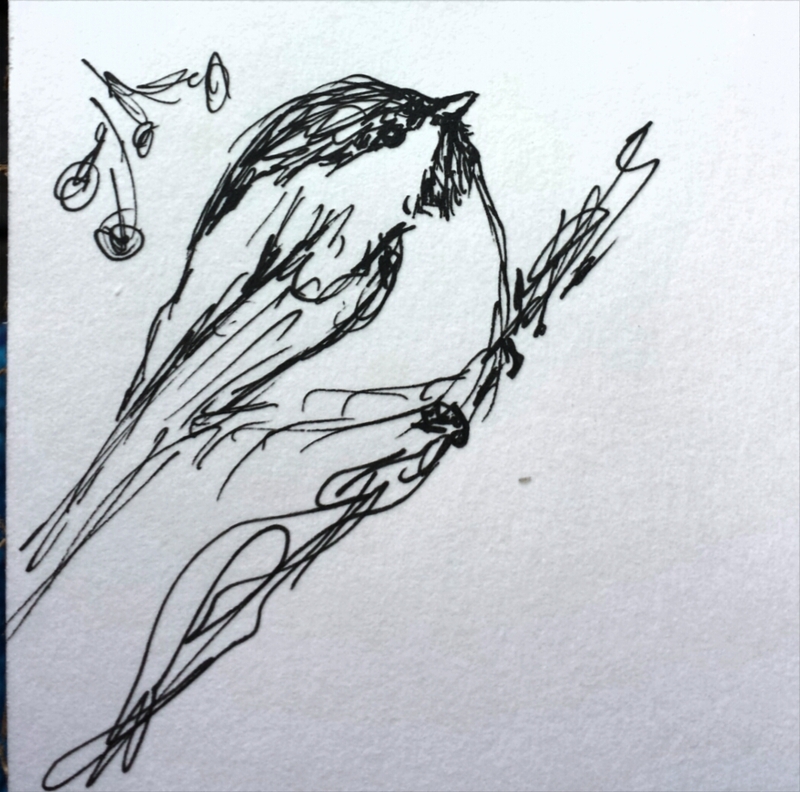 I call these my 5 second sketches and am challenging myself to do them daily. In using a Micron pen, it keeps me from attempting to perfect the sketch and just move on. I am studying Indiana backyard birds that winter over for some oil painting I am working on.